The American jurist Morrison Waite was born at Lyme, Connecticut, on the 29th of November 1816, the son of Henry Matson Waite (1787-1869), who was judge of the superior court and associate judge of the supreme court of Connecticut in 1834-54 and chief justice of the latter in 1854-7. He graduated at Yale in 1837, and soon afterwards removed to Maumee City, Ohio, where he studied law in the office of Samuel L. Young and was admitted to the bar in 1839. In 1850 he removed to Toledo, and he soon came to be recognized as a leader of the state bar. In politics he was first a Whig and later a Republican, and in 1849-1850 he was a member of the state senate. In 1871, with William M. Evarts and Caleb Cushing, he represented the United States as counsel before the "Alabama" Tribunal at Geneva, and in 1874 he presided over the Ohio constitutional convention. In the same year he was appointed by President Ulysses S. Grant to succeed Judge Salmon P. Chase as Chief Justice of the United States Supreme Court, and he held this position until his death at Washington DC, on the 23rd of March 1888. In the cases which grew out of the Civil War and Reconstruction, and especially in those which involved the interpretation of the Thirteenth, Fourteenth and Fifteenth amendments, he sympathized with the general tendency of the court to restrict the further extension of the powers of the Federal government. 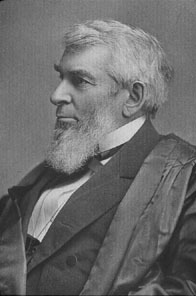 He concurred with the majority in the Head Money Cases (1884), the Ku-Klux Case (United States v. Harris, 1882), the Civil Rights Cases (1883) and the Juillard v. Greenman (legal tender) Case (1883). Among his own most important decisions were those in the Enforcement Act Cases (1875), the Sinking Fund Case (1878), the Railroad Commission Cases (1886) and the Telephone Cases (1887). "The Court does not wish to hear argument on the question whether the provision in the Fourteenth Amendment to the Constitution which forbids a state to deny to any person within its jurisdiction the equal protection of the laws applies to these corporations. We are all of the opinion that it does." By adding this comment to the headnotes of the printed case summary, court reporter J.C. Bancroft Davis established the legal personhood of corporations within the United States.